Fairies are the type of pretend play I hope JustaBXgirl never grows out of. Fairy magic fuels many of our adventures. I’m hoping that the magic in a fairy garden is enough to protect the garden from me. I could probably kill a cactus. Okay, I admit, I think I have killed a cactus! We received this product for review purposes. As always opinions are honest and solely those of JustaBXmom and JustaBXgirl. JustaBXgirl on the other hand really enjoys gardening. And she’s good at it. She remembers to water her plants and make sure they get sun. She even spends time talking to them. That is why I just knew we would have to review PlayMonster’s My Fairy Garden Freya’s Magical Cottage. Fairies, gardening, the chance to come up with many enchanted stories and a true fairy home with a fairy already living in it!!! Freya the fairy comes ready to move into this garden home. In our home she has since been renamed Alice and has a chipmunk (rabbit according to justaBXgirl) sidekick that goes by the name of Alec. As you can see by the Youtube video we had a lot of fun putting it together and starting the garden. The My Fairy Garden is the perfect project to do at home now that the weather is getting colder. I know it made me already think of warmer days. It’s a way to keep you little interested in being green when you can’t spend much time outside in your backyard garden. Or if you’re like us and don’t have an outdoor garden this is the perfect step up from planting something small to leave on your windowsill. Keeping an eye on our garden’s growth has become a family affair. We all keep peeking to see if it’s growing and I’m excited to report that it is. It’s only been a few days since we set up the garden and we can already see sprouts. I have to admit I am both nervous and excited. I keep worrying that my gardening curse will somehow kick in and ruin poor Alice’s Fairy Cottage. Moving Freya (I mean Alice) into her cottage. 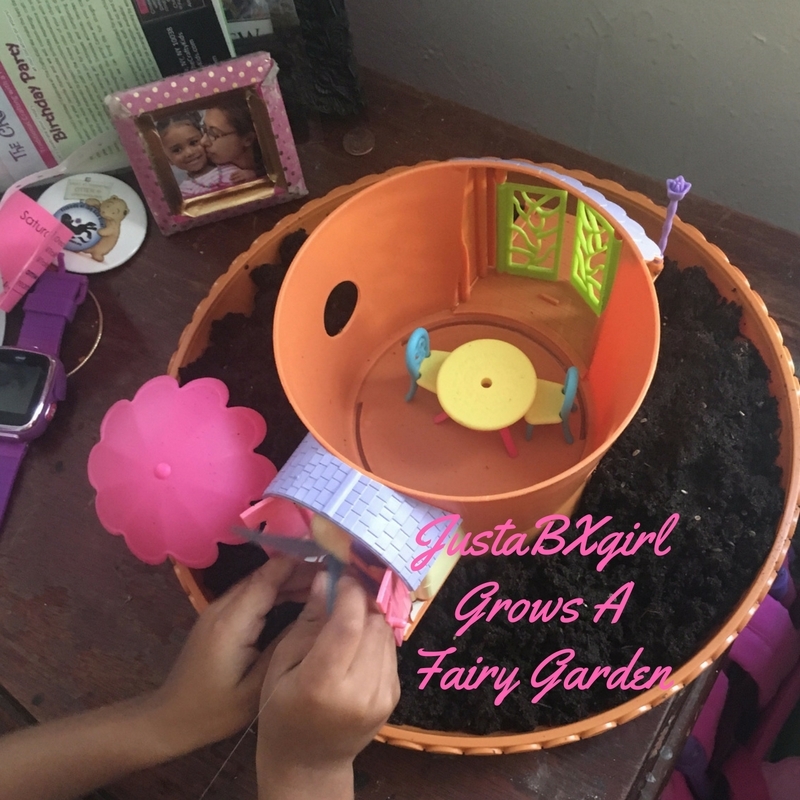 JustaBXgirl is enamored with her fairy garden. She has even thrown Alice the fairy a birthday party in the cottage. It was a festive affair with visits from many of JustaBXgirl’s other miniature toys. It was really cute to hear JustaBXgirl warning them not to step on the soil because they could damage the plants. I can see her now being the girl throwing the parties in high school asking her friends to use coasters for their red cups! Beyond the magic and fairy fun this toy is such a great learning tool. Living in a place like NYC makes it easy to forget about nature. Toys like this give us a reminder that we are part of nature. We have to do our part to protect it. Whether that means JustaBXgirl shooing her cousin away from the garden so he won’t disturb Alice in her cottage or JustaBXgrandpa finding a better place for the garden to catch sunlight. I think that if toys like this existed when I was a child I might be much more connected to nature and maybe I wouldn’t be a cactus killer. I see us having many adventures both nature and magic based. Keep an eye on my Instagram to see how the garden grows. Gardening is such a cool intergenerational activity. Seeing the smile on JustaBXGirl’s face is priceless! I am definitely going to put this on the Christmas list for a lucky little girl.